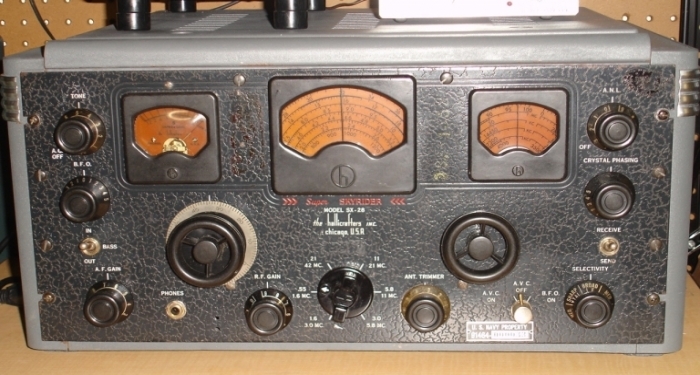 The Hallicrafters SX-28 is a 15 tube 6 band receiver that covers .54MHz to 43MHz. The radio uses an I.F. of 455kHz. The features on this receiver include a BFO, a Variable strength ANL, S Meter, Main Tuning dial lock(not installed on all models), Variable IF Selectivity(Broad, Medium, Sharp), Crystal filter, Two stages of RF Amplification and a Calibrated Bandspread. The front panel is a thick piece of heavy steel which is painted black and has engraved lettering and imitation leather graining. The power source is 120 volts AC or 120-240 volts AC at 25 to 60 cycles with the use of a universal power transformer. There is also a provision made for a 6 volt DC operation with the optional Vibrapack. The matching speaker for this radio is the Hallicrafters PM-23 or the monster R-12 console. The tubes and their functions are as follows, a 5Z3 = Rectifier, two 6V6 tubes in a Push-Pull Audio output, 6SC7 = 1st Audio, 6J5 = BFO, 6H6 = ANL, 6AB7 = ANL Amplifier, 6B8 = AVC Amp, 6B8 2nd Detector & S Meter Amplifier, 6SK7 = 2nd IF, 6L7 = 1st ANL Amplifier, 6SA7 = Oscillator, 6SA7 = Mixer, 6SK7 = 2nd RF Amplifier and a 6AB7 as the 1st RF Amplifier. Another neat feature of the radio is that on the back there is a phone jack for use with an external sound source such as a record player. Yes, the 6V6 in push pull configuration sounds that good. It is the opinion of this author that the SX-28 is the finest pre-WWII Hallicrafters shortwave receiver. 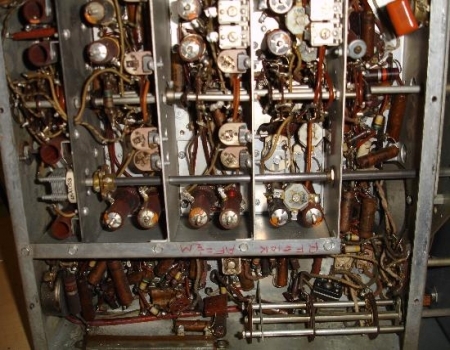 Many of these receivers saw service during the War. The SX-28 and its sister VHF models, the S-27 and S-36 are often pictured as rack mounted in British government listening posts for monitoring the German radar and other communications. The FBI also used these to monitor the airwaves for clandestine communications. 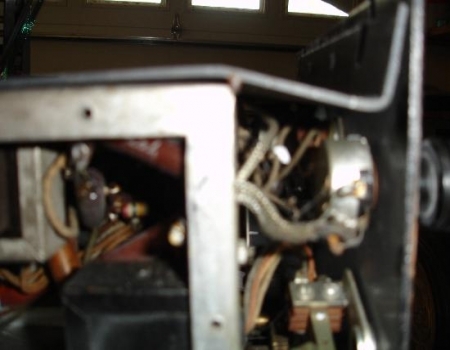 After the War, the SX-28 and SX-28a were used by the FCC to monitor domestic radio transmitters. A Radio News 1946 picture shows one installed in an automobile equipped for monitoring by the FCC. 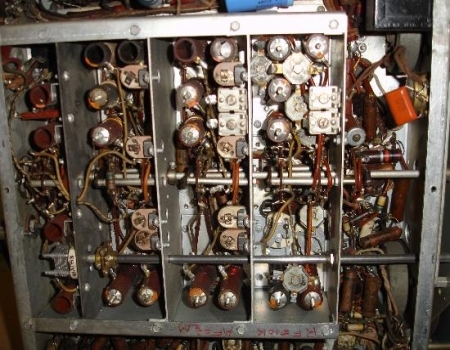 This receiver has a massive history behind it. The SX-28 series of receivers is one of my all time favorites hands down. They are true "boatanchors" weighing in at a good 75 pounds. Oh I almost forgot, besides all of the above, they just look great!! 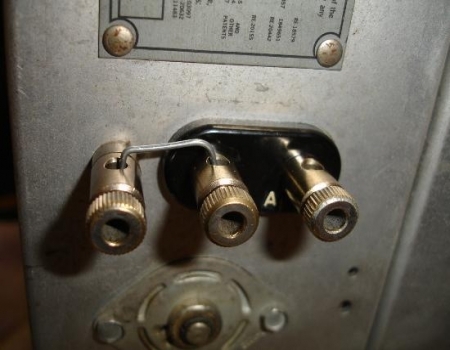 This receiver was built around August of 1943. The photograph on the left shows just some of the many pieces of this receiver I found loose inside the cabinet when the item arrived. 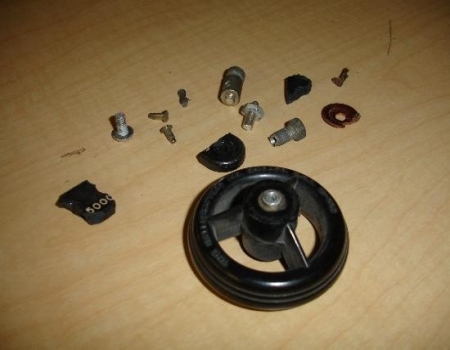 The picture on the right shows evidence that the shipper, UPS was so rough on the package that even the hard plastic grommets that hold the speaker connections in place were destroyed. See the photograph below for my temporary fix for these items until the exact replacements can be found. The picture on the left shows some more damage done by UPS. Looking at that thick metal plate at the top of the left photograph, I wonder how much force was applied to bend the metal like that? This side plate is securely attached to the face plate of the receiver and the side. The picture on the right is a photograph of under the chassis with the case removed and before the restoration process had begun. 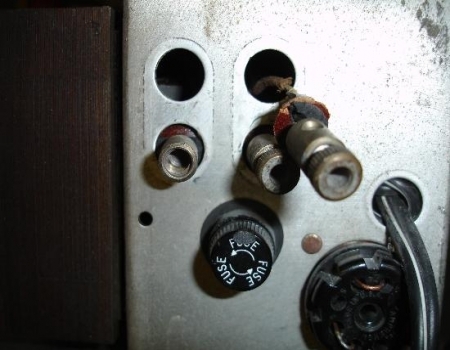 The red ink marks on the side of the RF deck as well as the orange capacitor is evidence that this receiver was serviced some time in the past. The picture on the left shows what the RF deck looks like for the SX-28. If your RF deck does not look like this one then you have the newer SX-28a. Both are fine radios!! All of my research into these receivers points out that the RF deck stands out as being the deciding factor in determining if a certain SX-28 series of receiver is an SX-28 or an SX-28a. The SX-28a has the Hi-Q Micro-set coils which look totally different. 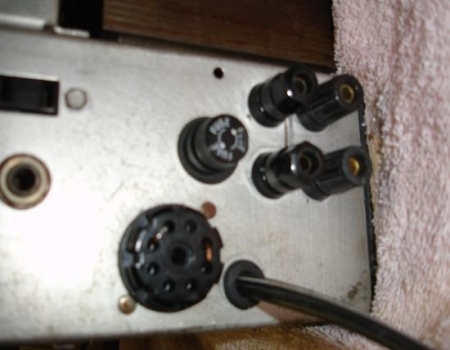 The picture on the right displays my "homebrew" fix of the four speaker connections until a set of original grommets can be found. The photograph on the left is showing part of the restoration process in action. Notice how the black antenna grommet and the antenna connections are looking like new. They are the originals. I have explained how this is done else where on this site along with some before and after pictures. Please CLICK HERE for them pictures. 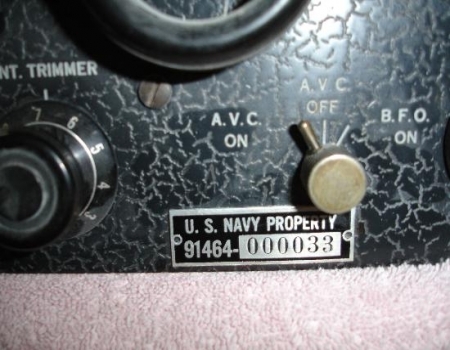 The picture on the right shows a metal plate that has the U.S. Navy Property marking on it. This plate is mounted on the front panel.